Christmas and New Years Eve have come and gone and “baby it’s cold outside!” I spent most of my life in the Northeast, but since moving to the Carolinas fifteen years ago, I have become a total wimp about winter weather. I don’t know if my blood has thinned (if that’s even a thing) or what. But when the temperature drops below 32° F, all I want to do is stay inside, snuggle by the fire, and consume a lot of soup. Soup is so comforting and warming, and after all the heavy holiday fare, a bowl of Tuscan White Bean Soup with bread or a salad is the perfect dinner for a cold winter’s night. 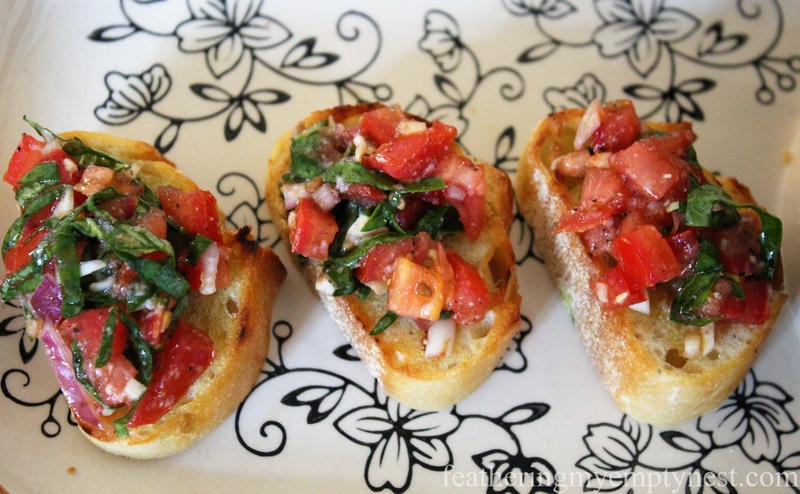 I particularly like to serve it with Bruschetta, which is an Italian antipasto consisting of grilled bread topped with vegetables. It’s the perfect compliment to this White Bean Soup because it’s bread and salad all in one. Melt the butter and olive oil in a stockpot over medium heat. Add shallots and garlic and cook until softened and translucent, about 3-5 minutes. Add 3 cans of cannellini beans, sage, chicken stock, salt, and pepper. Simmer for 15 minutes. Remove from heat and puree using an immersion blender until smooth. Return to the heat, add the half and half and the remaining 2 cans of beans. Simmer for another 5 minutes until the whole beans are heated through. 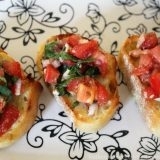 Serve hot with garlic bread or bruschetta. Place the rest of the ingredients in a bowl. Mix well and allow to sit for 10 minutes at room temperature to allow the flavors to meld. Top the toasted bread with the tomato mixture and serve. *Chiffonade is a fancy French term for slicing herbs or other leafy greens into thin strips. This is accomplished by stacking the leaves, rolling them tightly like a cigar, and finely slicing them perpendicular to the roll. 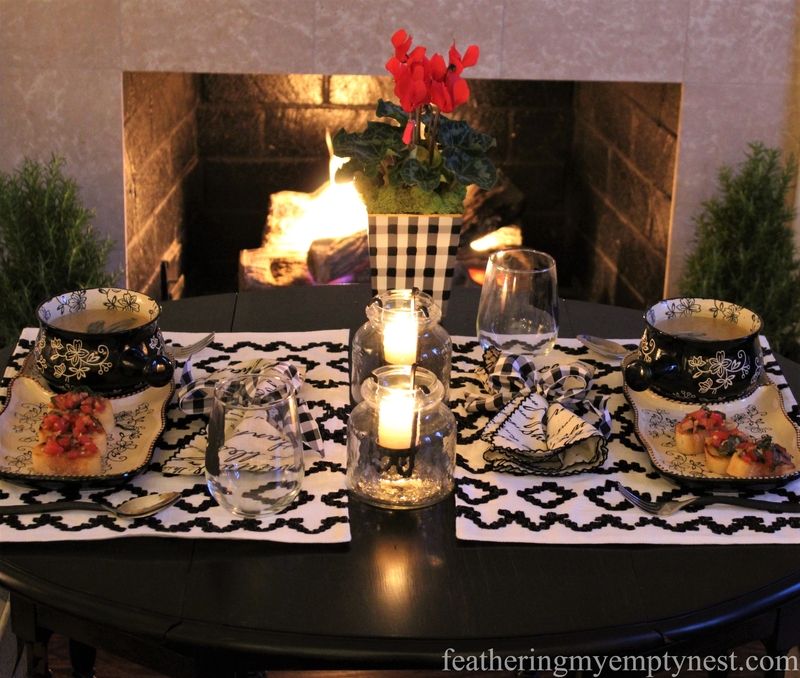 After the chaos of the holidays, I thought it would be a nice change of pace to set an intimate table for just me and my husband in front of the fire for our White Bean Soup supper. Several years ago, my mother gave me some cute soup and sandwich sets, which I felt would be perfect for this meal. 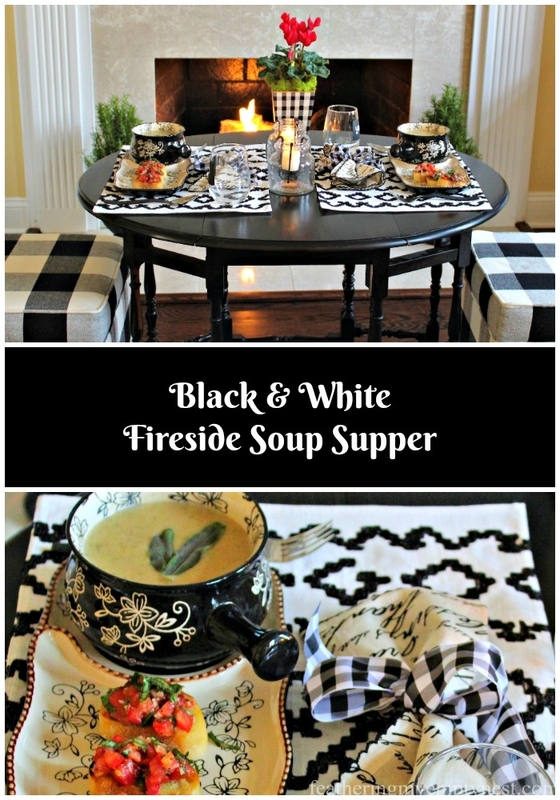 Since the plates and bowls are black and white, I decided to create a tablescape using this color scheme. 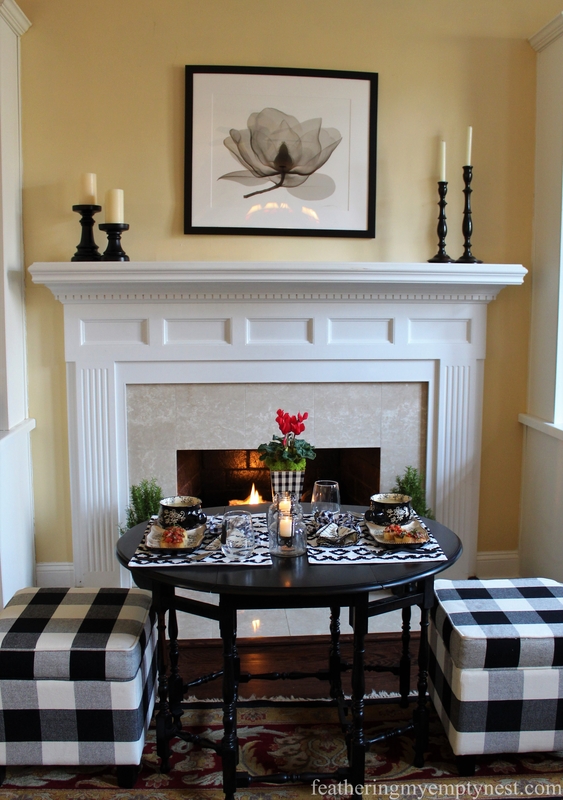 I started by placing my small black gateleg table and buffalo plaid stools in front of the fireplace. 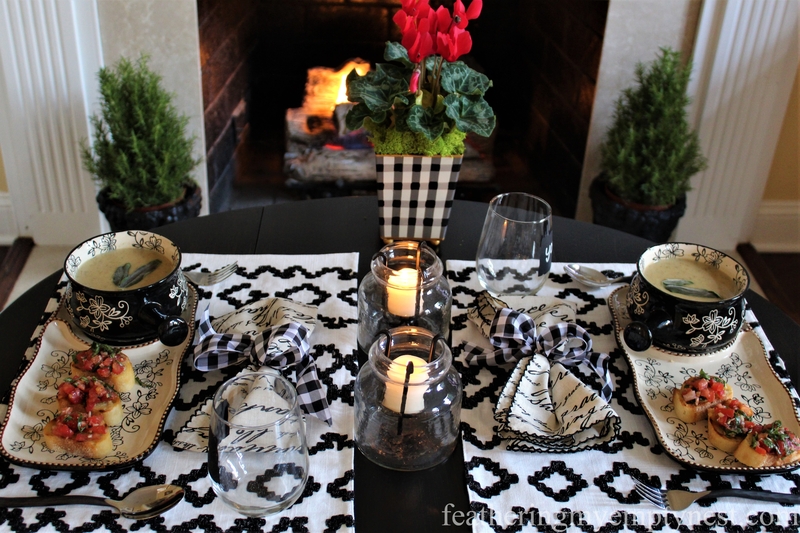 White and black geometric placemats anchor the table setting. The inexpensive rustic cutlery has blackened handles that look like hand-forged wrought iron. 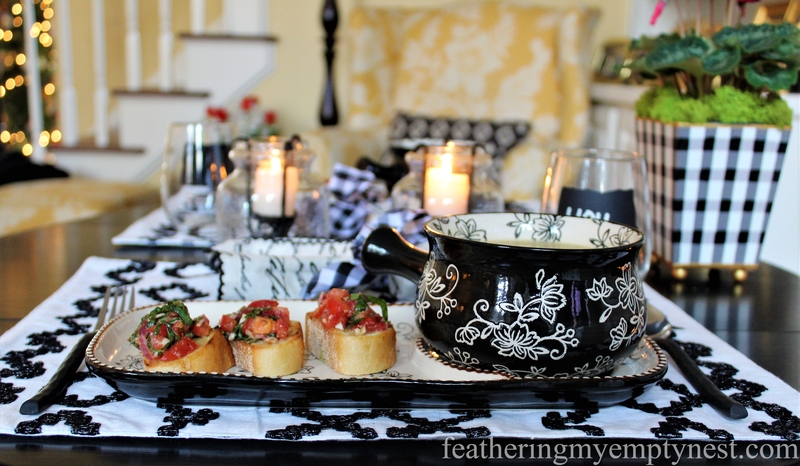 The stemless wine glasses keep the white and black theme going with chalkboard labels. Black and white gratitude script napkins are tied with simple black and white gingham ribbon. The ribbon ties the look together, as it coordinates with the stools and the cachepot. 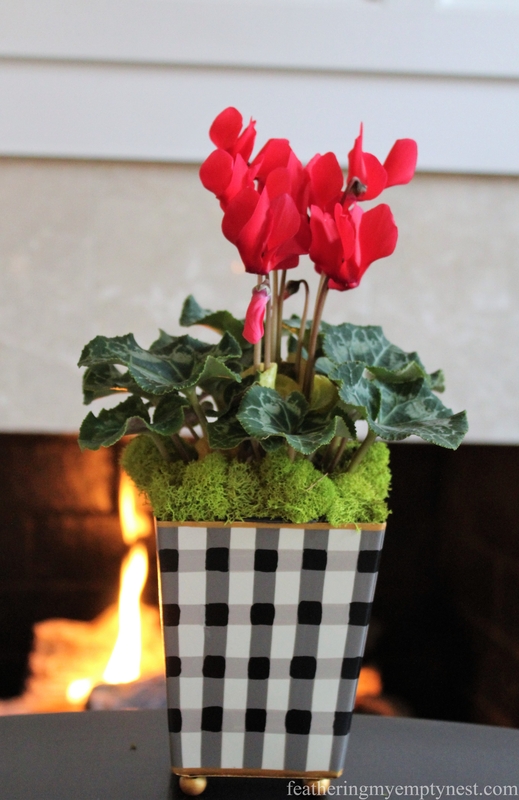 The red cyclamen in the gingham cachepot or planter offers a bright splash of color to the otherwise black and white table. A pair of wrought iron and glass votives completes the tablescape. The period after the holidays when you take down all the Christmas sparkle can be kind of cold and depressing. However, making a bowl of warming White Bean Soup and paying a little attention to creating a simple but attractive tablescape, can bring a special glow to even an ordinary winter evening. I love your adorable table setting, and the food looks yummy–I’ll be right over…lol! Saved the recipes and can’t wait to try your version. We are soup lovers as well. We live in Kennett Square, PA, across from Longwood Gardens, and our high today was unusually cold at 19 degrees. I really don’t mind the cold since I rarely stay outside for long periods during the winter, other than to take my walks, and really love it when we get snow because we never get so much that it’s bothersome. Every couple of years we’ll get one heavy snowstorm, maybe a foot or so, but nothing compared to places further NE of us. We’re fortunate not to get the awful ice storms that do so much damage elsewhere. When I lived in Williamsburg, VA they had a lot of ice storms that snapped a good number of trees and power lines. In which part of NC do y’all live? Stay warm, and may all good things be yours in the New Year. Thanks so much Bobbi. I hope you make the bean soup. It’s one of my favorites. It was in the 30’s in Charlotte today which is very cold for us. It’s supposed to stay in the 30’s all this week. We never get much winter weather here, which is a blessing in some ways, but I do miss the snow –although I don’t miss shoveling. Hope you have a wonderful New Year! Thanks for replying. I was thinking you lived in the NC mountains. I’m very familiar with the Charlotte area as my oldest son and dil live in Myers Park, just south of downtown Charlotte–a beautiful area for sure. Thanks so much Rose. This soup is indeed very flavorful and super easy to make. I hope you give it a try! It’s very similar to my white bean soup. Love your decor by the fireside. Wow! This looks delicious and I love your whole presentation. Thank you for sharing these great ideas and a happy new year to you and yours! Thank you so much for your kind comment. I wish you happiness in the new year as well! Thanks for the recipe and your presentation is beautiful! You’re very welcome. Thanks for taking the time to comment. I really appreciate it. 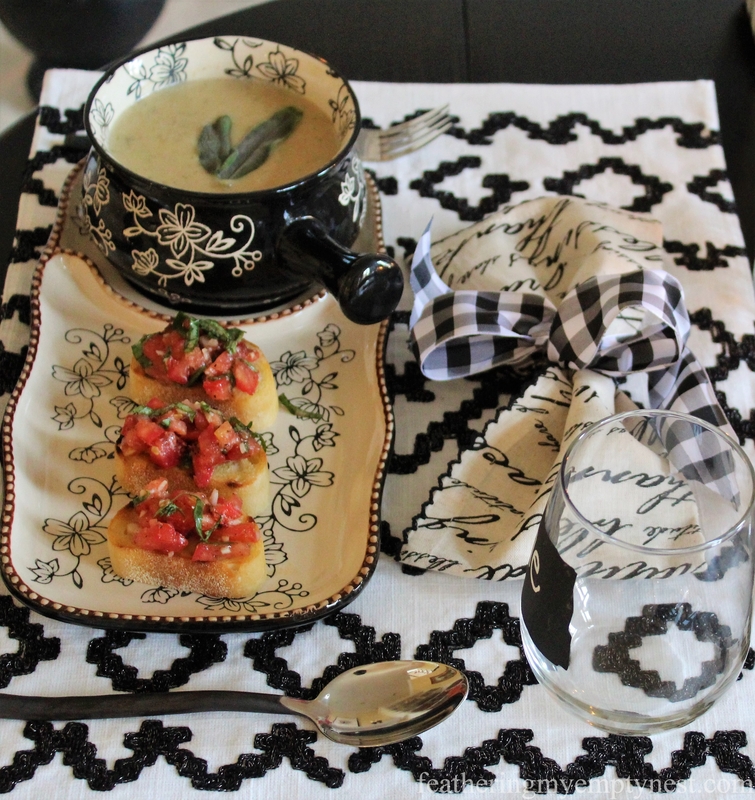 I come from a big family of “garlic eaters” so the soup and the bruschetta sound right up our alley. The table is lovely, and I love that there is a stylish way to label the cups to avoid cooties! Thanks so much for taking the time to comment. I especially appreciate the reference to “It’s A Wonderful Life” –one of my favorite movies. 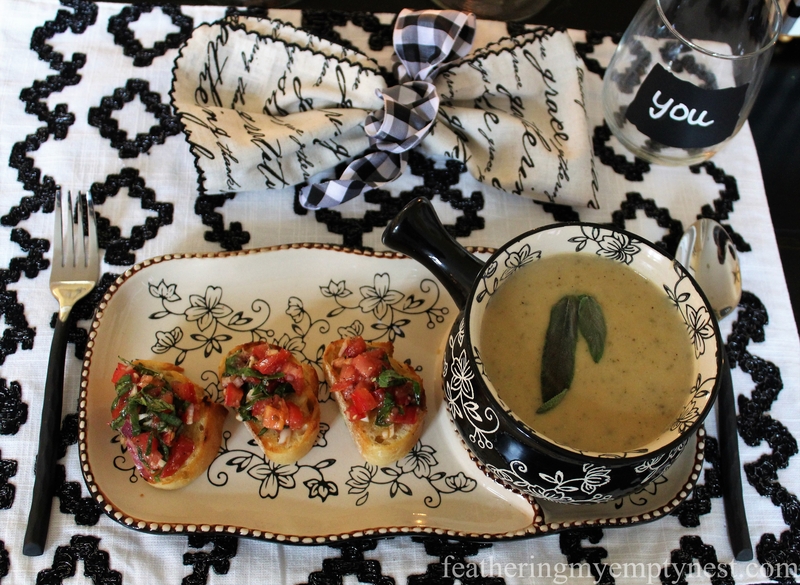 The white bean soup looks and sounds amazing especially with the addition of bruschetta! I feel like I got a 2 for 1 with your beautiful and cozy Tablescape! This is just magical with comforting soup in front of a warm fire! Thanks so much, Pam. 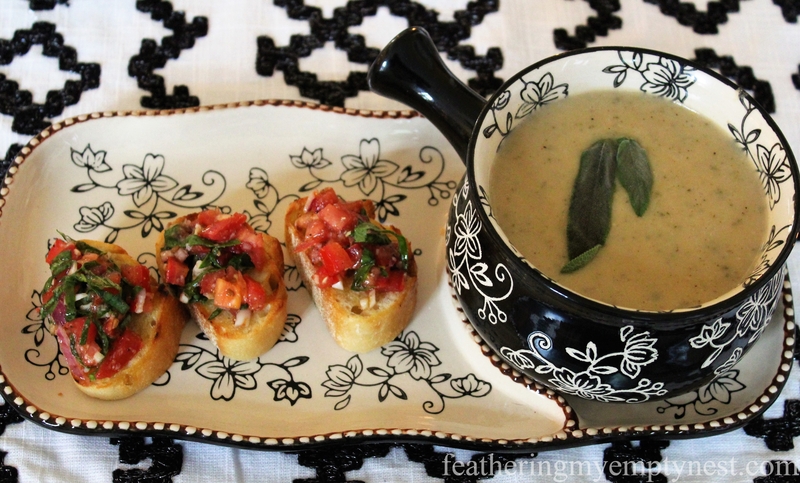 The white bean soup and bruschetta are a really yummy combination. I hope you give them a try. Stay warm! I love your table setting!! That looks like the perfect meal for a cold day! I love your sweet lunch by the fire! Thank you for inspiring me today! 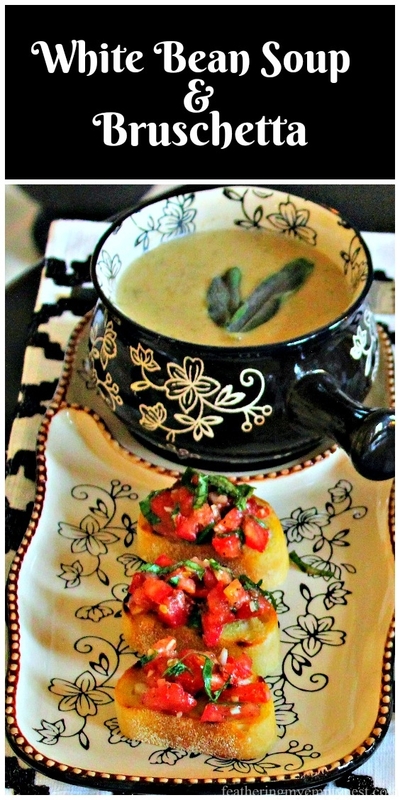 Thank you so much for your kind comment about my White Bean Soup & Bruschetta Fireside Supper. I really appreciate it! I’m a black and white enthusiast myself along with being a soup enthusiast, so this post is just my style. Thanks for sharing the recipe. 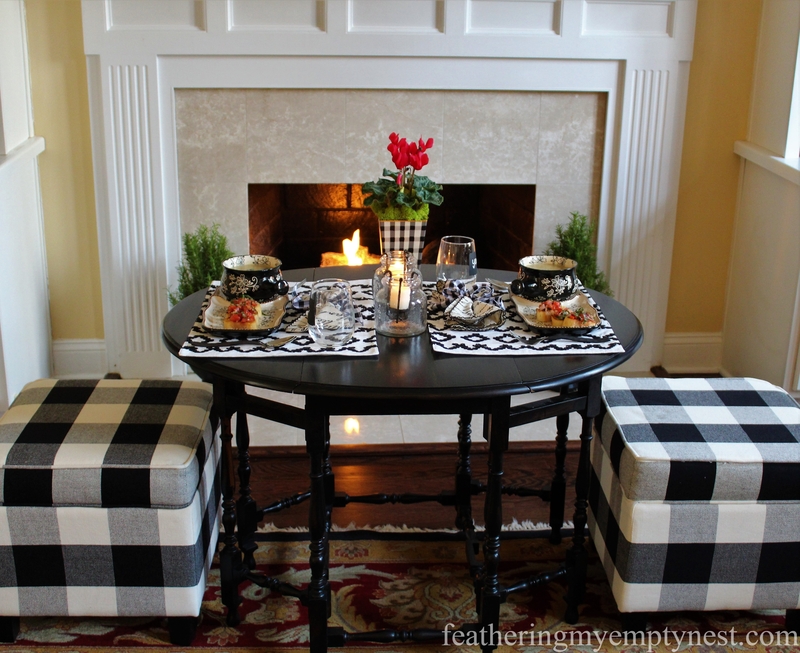 I adore your buffalo plaid stools and the darling cache pot! Have a great 2018. I’m your newest follower. Thanks so much for your kind comment and for following me, Sarah. I really appreciate it. 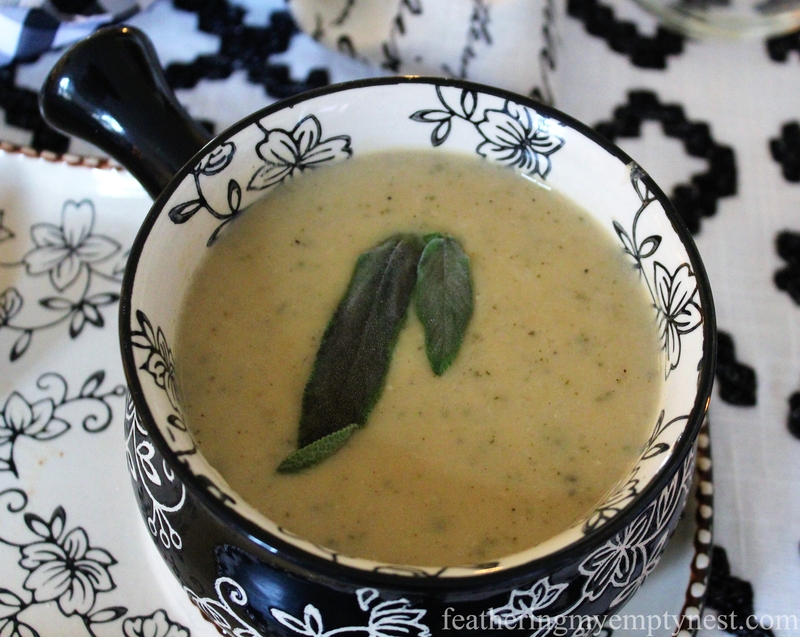 This soup is perfect for cold winter days! 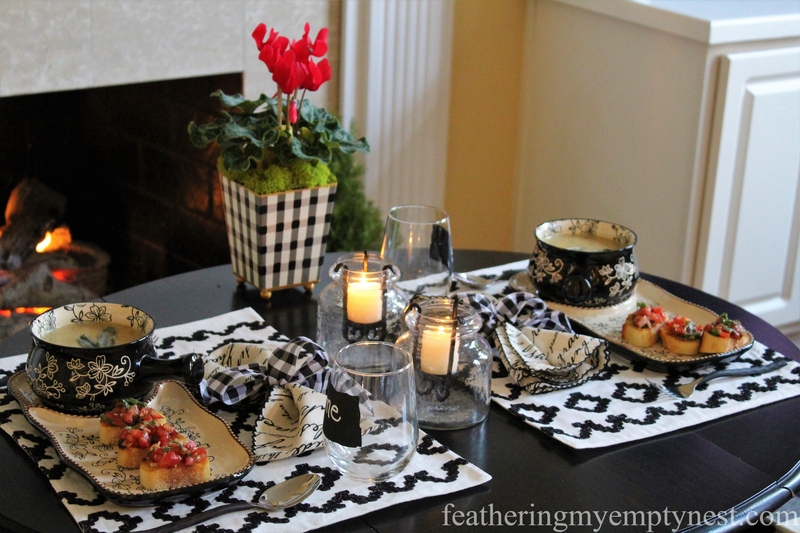 What a lovely tablescape you created! Thanks so much for your kind comment, Christina. We’ve got to do all we can to stay warm in this crazy cold weather! Thanks so much, Michelle. It has been unusually cold this winter. I hope you have a great new year too! Love your table setting! 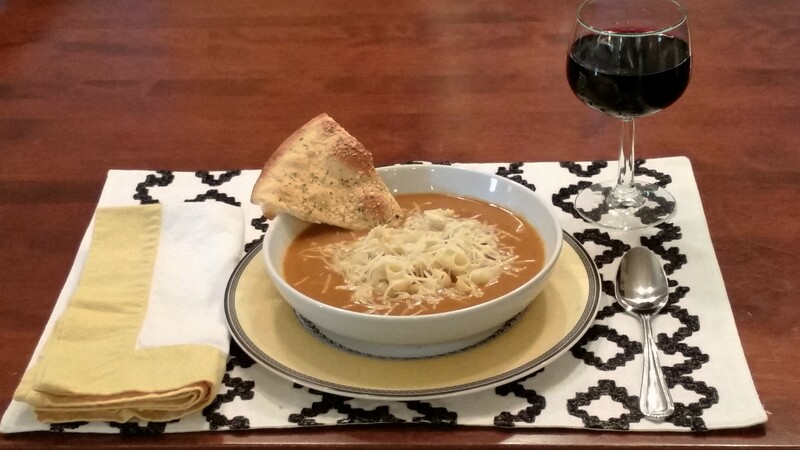 I’m always looking for easy soups to make so I’m definitely going to give this one a try. Thanks! Thanks so much, Kristi. 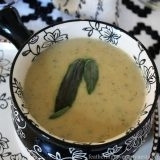 If you like the taste of sage, I think you will like the White Bean Soup. Sounds yummy and such a sweet thing to do for your hubby! Thanks so much Cindy. It is a yummy soup and quite filling. Thanks so much for hosting! Looks delish! Loving that little gingham cachepot! Thank you so much for your comment. I really appreciate it!